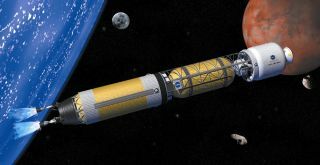 Artist's concept of a nuclear thermal rocket. Such vehicles could help humanity get to Mars and other planets in the solar system. CANOGA PARK, Calif. — Getting astronauts to Mars will take all the spacefaring expertise the United States can muster, including advanced propulsion technologies such as solar-electric engines and perhaps even nuclear rockets, according to NASA Administrator Charlie Bolden. In statements made during a visit to the Aerojet Rocketdyne plant here last Thursday (May 28), Bolden stressed that he'd like to slash the travel time required to send astronauts to Mars. Superfast propulsion tech would help limit astronauts' radiation exposure during the trek to Mars and reduce the amount of water, food and other "consumables" such a mission would require, NASA officials have said. Bolden was flanked by Aerojet Rocketdyne's CEO and president Scott Seymour and Julie Van Kleeck, the company's Vice President of Advanced Space & Launch Systems, during the news conference. The trio discussed the advanced solar-electric propulsion systems (SEP) the company has been working on. "We're now trying to get to higher power levels; that's the next step," Seymour said, referring to the 5-kilowatt (kW) engines Aerojet Rocketdyne is currently building for NASA robotic missions. "Fifteen kilowatts would be the next step, and then to cluster them together ... then, in the long term, 50 to 100 kilowatts." "The limiting power of this type of propulsion has been the power to drive it," Bolden said. "Aerojet Rocketdyne has partnered with different entities around the country in looking [at] how to get more energy density onto a solar cell. The more power we can get, the larger we can make the engine and its capability. "The advantage of using that kind of propulsion, pound for pound, is that it can fly nearly forever as opposed to chemical engines," Bolden added, in reference to the traditional liquid-fueled rocket engines that propel the vast majority of NASA's spacecraft. But these SEP units — which generate thrust by accelerating charged atoms and molecules out the back of a spacecraft — are limited in what they can accomplish. Discussing more advanced in-space propulsion, Van Kleeck referred back to nuclear rockets, such as the NERVA (Nuclear Engine for Rocket Vehicle Performance) system studied by NASA decades ago. "We don't build rocket engines; we depend on our industry partners. " Bolden said. "My job is to try and keep things stable for them, to let them know that we are committed to in-space propulsion." Bolden said that he wanted to put more money into these advanced space-only systems, which could potentially be "game changers" — and not just for delivering cargo to Mars. "You've got to be specific," Bolden said. "If I say I want game-changing in-space propulsion, everyone will go back to [the idea of] moving cargo. I want industry to focus on getting peopleto move really fast. I think we can do far better than we are doing today, but we've got to show our commitment by putting some money into it."